WASHINGTON — THE talk up in Boston is all about deflation while the talk down here is all about inflation. Our sleek, techie president, whose battery dies faster than an iPhone’s, was fully charged Tuesday night for the State of the Union. He was so puffed up, with such a bristling sense of self, that it was hard to believe this was the same guy who spent the last year clenched like a fist, beset by ISIS, beheadings and Ebola, shunned by his own party and slammed by the other party in the fall election. Proving once again that he is a different kind of cat, Barack Obama is oddly pumped by his party’s defeat. Even in the House chamber, surrounded by hundreds of people and watched by millions, he seemed to delight in his detachment as he laid down his own markers to drive up his own numbers. He doesn’t mind splendid isolation. He really thinks it’s splendid. He’s free to revert to being the consummate outsider who doesn’t see himself in the context of a system. He likes the game better when he’s up against an opposing team. To him, Harry Reid was as big a problem as Mitch McConnell. Now it’s easier for him to see who he is and where he stands vis-à-vis the Republicans because he doesn’t have to make intellectual compromises or negotiate the jagged shoals of the old-school Democratic Party. Now he can define himself against modern conservatives such as Rand Paul and Scott Walker. President Obama feels he will be able to finally float above it all, more singular and more interesting and more separate, debating enlightened progressive topics like criminal justice reform and child care infrastructure while those off-kilter conservatives fight it out for 2016. Unlike F.D.R., Obama was not determined to give Americans heart and courage at times of crisis. Instead, his White House tended to take on the coloration of his funks and the clouds spread worldwide. He’s alone on the stage — always his preferred setting. As an isolato, he can say what he thinks and define himself on his own terms. He can ascend to the mountaintop and ignore us when we pester him to come down. He doesn’t have to negotiate with Republicans anymore. He doesn’t have to stroke Democrats anymore. He doesn’t have to hawk himself to voters anymore. He isn’t concerned about Hillary, as he yanks the party to the left. He has forged no lasting links to foreign leaders. And he can have the “vacation from the press” that he told NBC News’s Chuck Todd he yearns for. “Barry got his groove back,” as Larry Wilmore, the droll host of Comedy Central’s “The Nightly Show,” put it. We got the guy we’ve been yearning for only when he was able to blow us all off. He can finally do and say whatever he wants. It seemed a shame, the Democrat said, that Obama couldn’t have a third term, now that he was, at long last, fired up and ready to go. Of course, if there was a third term, he would be waiting another four years to show the mojo. Thrilled to sidestep the press, he felt liberated enough, even as Yemen spiraled, to go on YouTube and make his case to the appealing GloZell Green, a YouTube star wearing glowing green lipstick who got famous eating cereal out of a bathtub. Remarkably, The One has ended up in the same place the unpopular W. found himself at the end of his two terms: casting his lot with history. Now that it’s all about him, he doesn’t get languid and reflective. He rolls up his sleeves and crisscrosses the country. 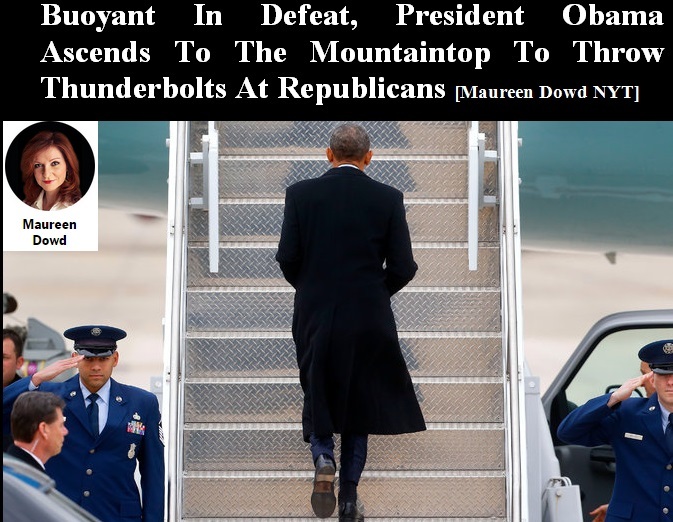 This entry was posted on January 24, 2015 at 7:36 pm and is filed under Uncategorized with tags barack obama, Democrat, Democrats, economy, GOP Obstruction, Jobs, John Boehner, john mccain, Maureen Dowd, Mitch McConnell, mitt romney, New York Times, obama, Obama Ascends To The Mountaintop, Obama No Apologies To GOP, Obama The Man The Courage, Obama's Courage And Conviction, Obama's Resolve, President Obama, President Obama Buoyant In Defeat, Republicans, The State of Obama Is Strong, Throwing Thunderbolts At Republican, White House. You can follow any responses to this entry through the RSS 2.0 feed. Both comments and pings are currently closed.